The driver of a silver Toyota Yaris was struck from the rear by another vehicle. 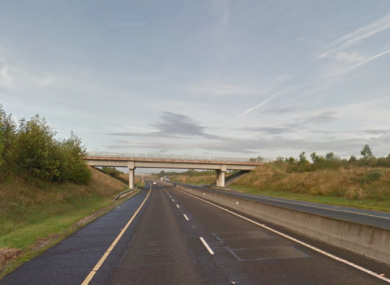 GARDAÍ IN WESTMEATH are appealing for witnesses to a hit-and-run that occurred on the M6. The incident happened on the westbound side of the motorway between Junction 5, Kilbeggan and Junction 6, Moate on Wednesday at around 9pm. The driver of a silver Toyota Yaris was struck from the rear by another vehicle causing it to spin across the road. The driver of the Toyota Yaris did not require hospital treatment. The offending vehicle, which gardaí have no description of, failed to remain at the scene. Gardai are asking for witnesses who may have travelled this stretch of road between 8pm and 10pm on the night or to anyone with information that can assist to contact Athlone Garda Station on 090 6498550, the Garda Confidential Telephone Line 1800 666 111 or any garda station. Email “Gardaí appeal for witnesses to motorway hit-and-run”. Feedback on “Gardaí appeal for witnesses to motorway hit-and-run”.